Thank you For the Chef for sponsoring this post! Another happy post coming your way, folks! I’m excited about today’s recipe because 1. It’s sponsored by For the Chef, one of my favorite kitchenware companies, and 2. It’s a powerhouse of delicious vegan protein that will put naysayers to shame! For this recipe I went for the trifecta of vegan protein – nuts, beans, and quinoa. This salad has a whopping 30 grams of protein per serving!! I also toasted nuts and seeds – rendering them crunchy and slightly chewy – so of course those had to go in the salad too. The almonds add a hint of smoky and spicy flavor that just goes perfectly with the mealy beans and hearty quinoa. I also felt inspired by the awesome cast-iron skillet the lovely folks at For the Chef sent me to try out. It really is the most perfect little skillet – only 6 and 1/2 inches in diameter, it’s perfect for toasting small batches of nuts and seeds, like in this recipe. And my favorite part is that it’s not super heavy like my other bulky 10-inch cast-iron pan. There’s nothing scarier that trying to lug around a piping hot skillet that you can barely hold with one hand! Fortunately, the skillet that For The Chef sent me was the perfect size and weight for my needs. 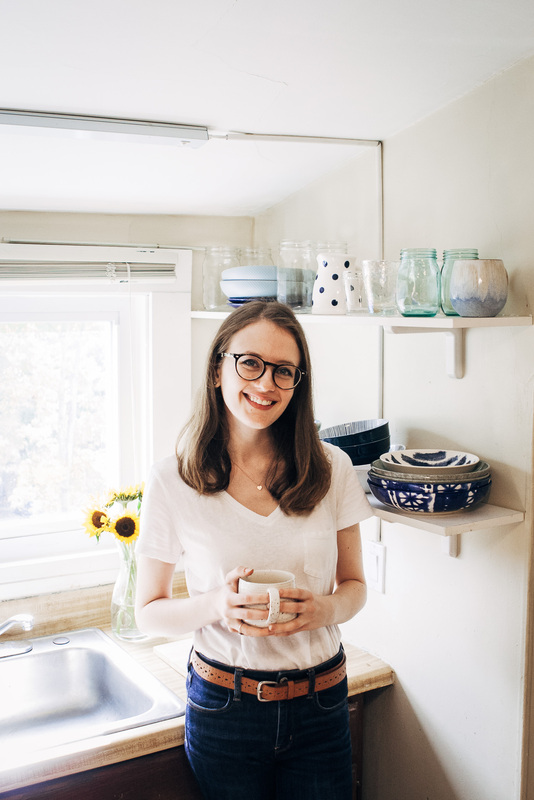 Now I just need to be careful not to spend all of my money on other kitchen goods from their store (a very real possibility, I might add! ), like these gorgeous wine glasses or this classic French press. It’s gourmet heaven! 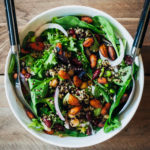 This vegan power protein salad has 30g of complete protein per serving, thanks to quinoa, kidney beans, chickpeas, and edamame. Start by toasting the almonds. Bring a cast-iron skillet or other skillet to medium-high heat. While the skillet is heating, combine almonds, olive oil, and spices in a bowl. Just use enough olive oil to lightly coat the almonds, not any more. Mix well until almonds are evenly coated with the oil and spices. 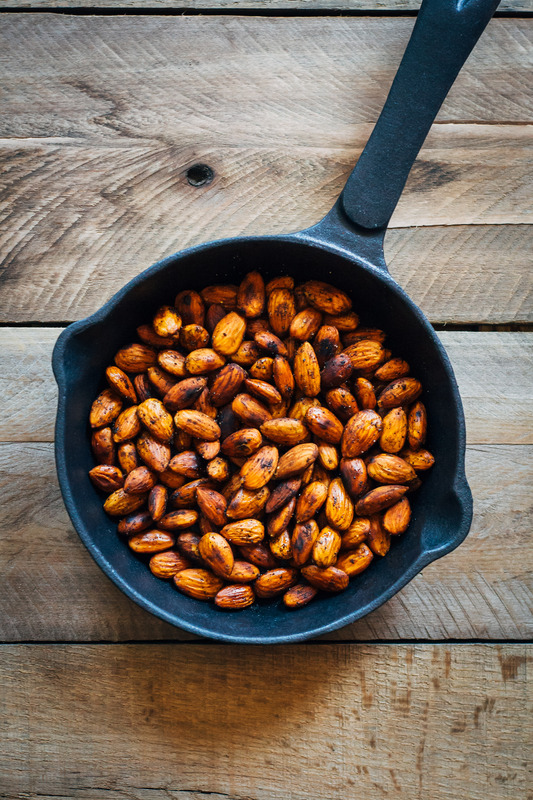 Once skillet is hot, add spiced almonds to the pan and sauté for 3-5 minutes, or until the almonds start to brown and become fragrant. Be sure to stir frequently so that the almonds don't burn. You may hear a popping noise - it's just the almonds cracking. Once almonds are done cooking, remove from the skillet and let cool for a few minutes. 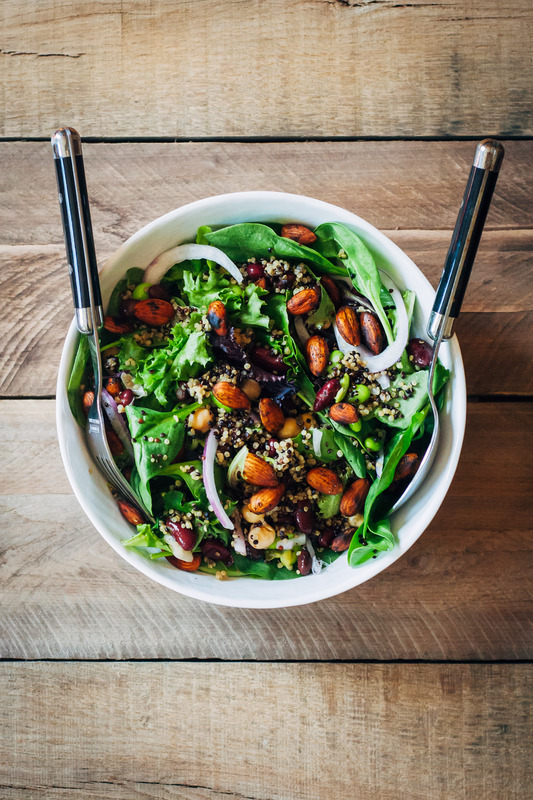 Assemble your salad - toss mixed greens, quinoa, beans, and onion with your favorite salad dressing until evenly combined. 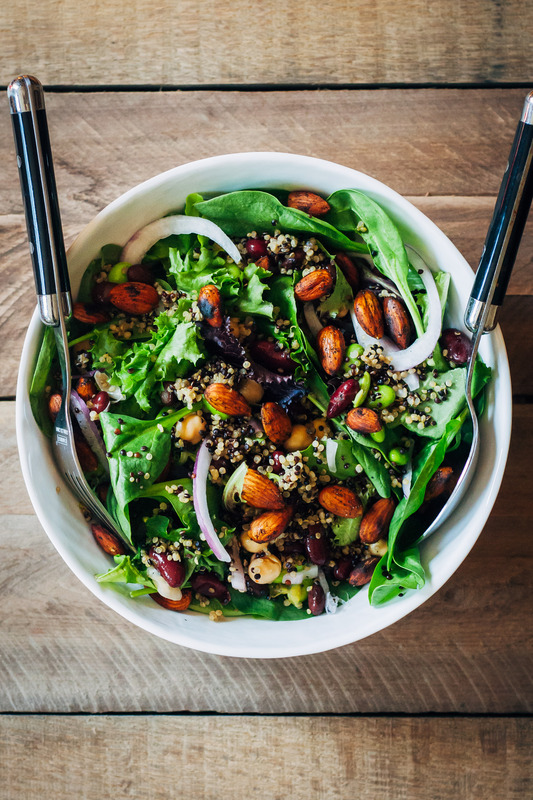 This salad is really versatile - feel free to sub quinoa with any other grain (like rice or wheatberries), or sub any type of hardy beans for the beans listed in the recipe. It'll all taste great! 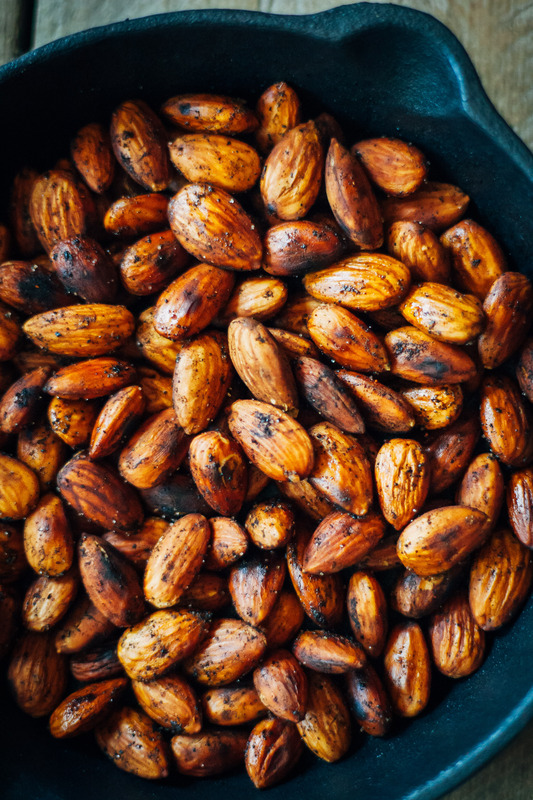 If you're pinched for time, feel free to sub the roasted almonds with raw or salted almonds bought from the store (or any other type of nut you like). Aren’t they the best?! I just want to buy everything on their website! ;) Thanks Abby! Love the almond edamame combo! Sounds delicious and looks amazing! I didn’t know that company, I’m gonna explore their website! Anyway, those almonds *_____* They seems so flavorful! i would eat this salad just for those almonds!!!! They are pretty darn good!! ;) Thanks Dixya! The flavours in this sound soooooooo good! You got it so spot on. And I love the variety of protein sources. 30g? Impressive. 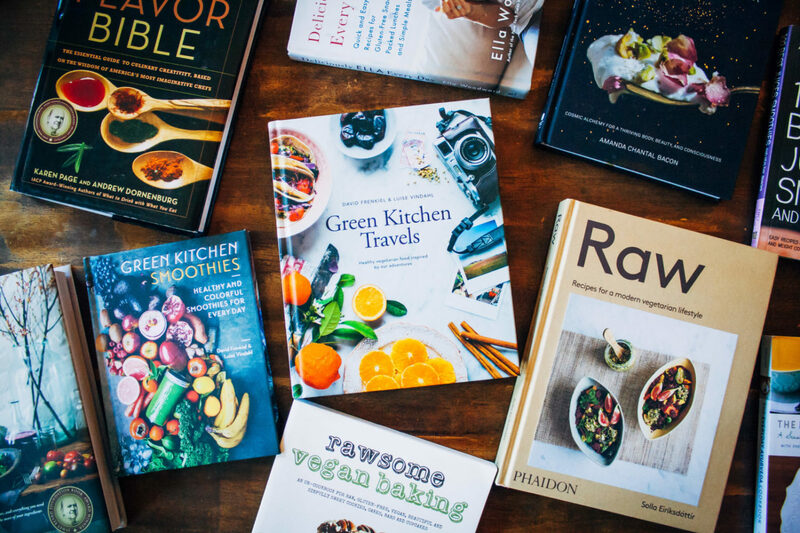 I just found your website and I am OBSESSED. So I have a question if you don’t mind :) I have a lot of digestive issues and cannot currently tolerate beans or too much processed soy. :/ but I need to gain a lot of muscle and I’m searching for ways to get protein that is easy on the digestion. Any help/suggestions are greatly appreciated!! I’m always looking to up my protein and sometimes it’s hard but this salad looks fantastic and 30 grams of protein in one serving is perfect. 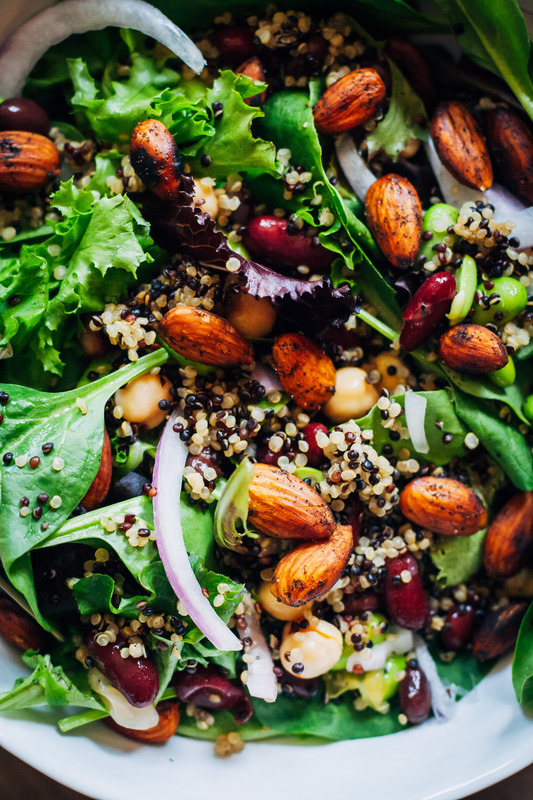 I love adding nuts to salads – and your photo of the almonds is gorgeous. Will be making this soon – pinning too! This looks incredible! I cannot WAIT to make this later today!! This was really good Sarah! I loved the crunch of the Almonds. Thank you! I’m so glad you liked it Marla!! :) Thanks for stopping by! I made this recipe today and followed it exactly other than having to use the whole edamame because I couldn’t find the shelled ones and was short on time. I highly recommend using the shelled ones though. I thought this was a very hearty flavorful salad and will make again.